We provide a range of services to schools. Workshops are available nationwide for GCSE, A-level and Key Stage 3 classes. One-to-one lessons taught using the Rockschool Music Production syllabus are available to schools in London and the South East. Recording studio and music technology suite installations are also offered at affordable rates. Our fun, interactive workshops focus on a wide array of music production skills, from recording live instrumentation to using loops and sequencing MIDI tracks. All workshops are tailored to your learning objectives and printed handouts and other learning materials can be provided. Recent workshop activities have included recording and mixing an original student song, producing an EDM track and remixing Taylor Swift. If you have any Key Stage 4 students who are considering taking the Edexcel Music Technology A-level in the future, this is the perfect opportunity for them to get more hands-on with music production software before making their final subject choices. 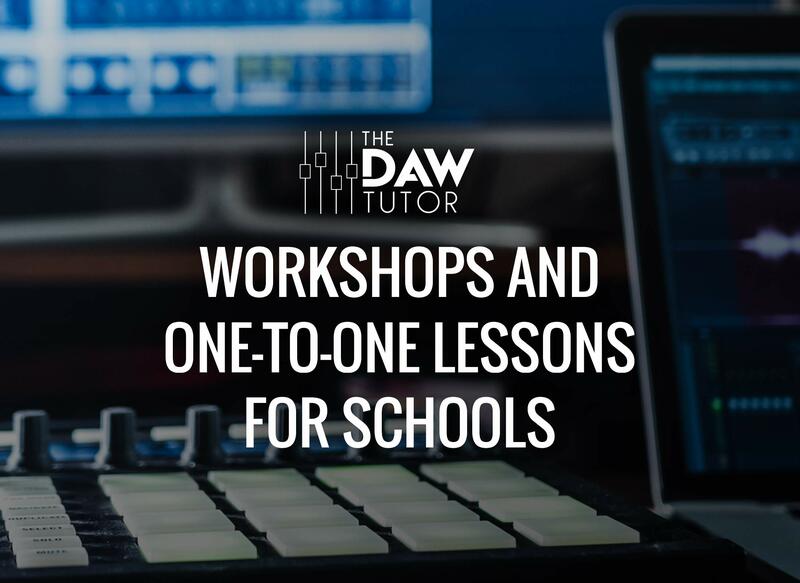 We offer workshops nationwide to students of all abilities aged 11-18, so if you are looking to engage your pupils with music production, please get in touch with your requirements. 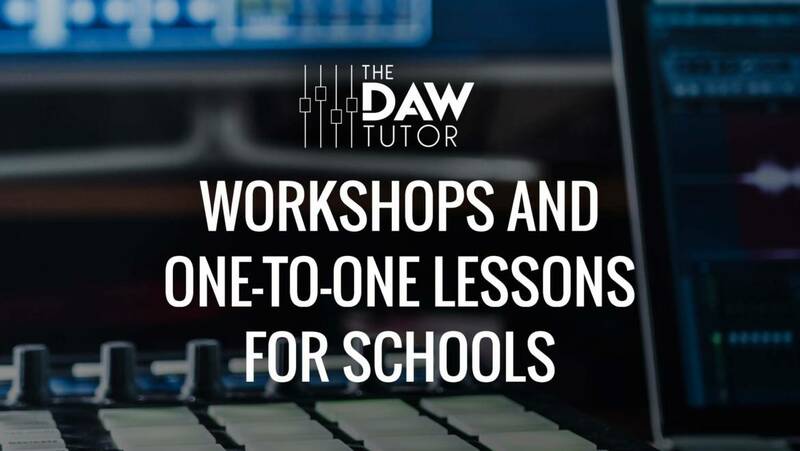 The DAW Tutor is pleased to offer one-to-one lessons covering the entire Rockschool Music Production syllabus from Grades 1 to 8. We can send a tutor to your school to deliver back-to-back lessons of 30 minutes to an hour, once a week during term time. A considerable saving can be passed on to parents if your school signs up more than 10 students at a time. To discover more about the Rockschool Music Production syllabus, visit this page. We offer a full installation service for all music technology products. Schools qualify for an educational discount. Please visit our studio installations page for more information. Learning an instrument can be a vital part of a child’s development. Over the last 25 years, rock and pop instrument lessons for guitar, bass and drums have become a staple of extra-curricular learning in secondary schools. The nature of music, however, is constantly shifting, so it follows that music eduction should evolve with it to keep students engaged. Teaching students the art of music production will help them develop skills from a young age that are now vital in the music industry. Today’s working musicians are very often expected to be able to produce, record, mix and edit their own music. With the advent of YouTube and digital music streaming services, it has never been easier to get your music heard by a wider audience. The other side of this coin is that there has never been so much music available to the casual listener. If you want your music to stand out from the crowd, you need to sound good on record – the role of the producer has never been more important. 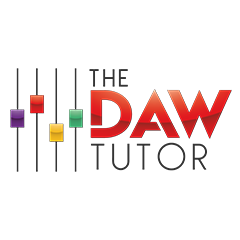 You may not have the resources in house to teach music production, so this is where The DAW Tutor comes in. We offer workshops and peripatetic tuition from an experienced industry professional who holds an MA with Distinction in Music Production. Our tutor has been a songwriter and performing musician for over 20 years and has taught private music production lessons for the last 9 years. He is passionate about music technology education and strongly believes that anyone should be able to access quality tuition, regardless of background, age or ability. To request more information about our workshops, one-to-one lessons and studio installation services, please click the button below.